With a shake of the head and a face dripping in disbelief, Ryan Fulton headed down the players’ tunnel. Around him gushed infectious smiles, warm applause and, of course, the puffing of cheeks with relief. Yet for the loan goalkeeper, how the injustice must have pained. Deprived of a clean sheet at the death against Cambridge United, it ensures the highly-promising stopper from Liverpool has yet to achieve a Pompey shut-out. During eight appearances, to his immense credit the teenager has finally added reliability and stability to a position which has long troubled Paul Cook’s era. On Saturday, he was part of a Blues side which cruised to victory, the latest in a growing queue of must-win occasions since the turn of the year. Comfortable, oh so comfortable, against a niggly Cambridge United side intent on squaring up to ruffle the hosts. Yet Shaun Derry’s side carried pillows rather than baseball bats for their intimidatory tactics, rendering them largely punchless. Certainly not as threatening as the physically-overbearing Barnet or the snarling approach delivered by Oxford United recently. In the face of provocation on such occasions, a soft Pompey underbelly has been worryingly glimpsed by those present. Not so on Saturday as United’s not unreasonable gameplan failed to deliver any meaningful blows to opponents still reeling from that night at The Hive. Yet for Fulton there was hurt, an agony delivered by Luke Berry bundling home from close range on 90 minutes following substitute Mark Roberts’ header back across goal. While at the final whistle the Fratton faithful cheered and Cook and then Leam Richardson took turns to grin and wave at the sight of favoured guests sat in the South stand, Pompey’s goalkeeper cut a disappointed figure. Certainly Fulton deserved what would have been a maiden clean sheet in the Football League. It may have been a fixture of few goal-scoring opportunities for either side, yet Cambridge barely mustered a reasonable attack during the duration. In fact, in Jimmy Spencer they had a striker more intent on spoiling than shooting, hence his essential withdrawal at half-time. The closest he came to the Blues’ penalty area, he opted to theatrically throw himself to the ground following a challenge from Adam Webster. No spot-kick decision arrived, while the pumped up 24-year-old proceeded to hit Ben Davies, Danny Hollands and then Enda Stevens late. Already on a yellow card, Derry wasted no time in hauling him off at the interval to avoid being reduced to 10-men. Regardless, Saturday was Pompey winning ugly, and there should be no complaints at the methods employed to eke out the points to lift them into fifth spot in League Two. Indeed, but for the unfortunate late slight on Fulton, it could be considered a highly-efficient performance, bordering on perfect in the circumstances. Dominant throughout and inspired by the returning Danny Hollands in the engine room, Cook’s men were thoroughly worthy of victory. Ultimately, though, the final scoreline suggests the match was closer than it actually was. Pompey still have many more gears to find. And for those doubting the character following recent performances, it was present at Fratton Park in abundance during a display ranking as gritty rather than classy. Still, three points were required and that is what the Blues served up, without a flicker of self-doubt. For the encounter, Cook opted to roll out a 4-4-2 system, employing a two-pronged attack involving Marc McNulty and Conor Chaplin. Chaplin undeniably deserved his first league start since September in a campaign which has seen him grab five goals from the substitutes’ bench. With Michael Smith and Adam McGurk out injured, he was thrust into the Blues team, subsequently adding energy and a deft touch. Chaplin was one of four changes to the team which performed so poorly at Barnet in the week as the manager attempted to secure a vital win. Christian Burgess was back from a one-match ban to replace Matt Clarke, while Hollands was presented with his first appearance since breaking his leg at Ipswich Town in the FA Cup, taking Ben Close’s spot. Kal Naismith came in for McGurk, operating on the right-hand side of midfield for only his second-ever Fratton Park start. Finally, with Gary Roberts missing through a hamstring problem, Chaplin was restored to the side, a decision which no doubt also invigorated the crowd. Throughout the hosts looked the most likely to score against a Cambridge line-up which included one-time triallist Shane O’Neill in midfield. Essentially a defender, he was pushed further upfield to fill the gap prompted by the gentleman’s agreement over James Dunne following his Blues departure in January. However, it wouldn’t be until the 41st minute before the deadlock was broken. Doyle laid a free-kick into the feet of Chaplin, who clipped a first-time lay-off to McNulty on the left. The striker took one touch to drive into the box before unleashing a fierce right-foot shot past Will Norris for his ninth goal in 21 games. 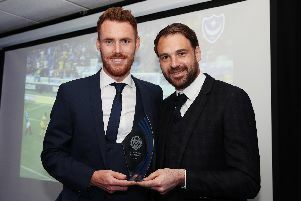 In the process, McNulty finds himself as Pompey’s leading scorer as he continues to enjoy life away from Sheffield United. The advantage was doubled on 63 minutes, a move started and finished by Adam Webster. The defender surged towards the Fratton end with the ball and, having laid it off, maintained his charge into the penalty area. When Norris brilliantly tipped Kyle Bennett’s fierce right-foot shot onto the bar, there was Webster to steer the ball home from six yards with the outside of his left foot. Pompey remained in control, Cambridge’s forays into the final third becoming increasingly infrequent as the game wore on. Yet on 90 minutes, a rash challenge from substitute Gareth Evans gave away a free-kick down the left – and Derry’s men had their consolation. Heartbreak for Fulton then as that treasured clean sheet was so cruelly snatched away at the death. Yet it was a victory nonetheless, Pompey are back to winning ways – and how they need many more.